Dimethylglyoxime is a chemical compound described by the formula CH3C(NOH)C(NOH)CH3. Its abbreviation is dmgH2 for neutral form, and dmgH for anionic form, where H stands for hydrogen. 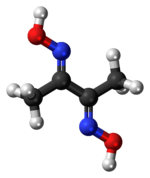 This colourless solid is the dioxime derivative of the diketone butane-2,3-dione (also known as diacetyl). DmgH2 is used in the analysis of palladium or nickel. Its coordination complexes are of theoretical interest as models for enzymes and as catalysts. Many related ligands can be prepared from other diketones, e.g. benzil. Dimethylglyoxime is used to detect and quantify nickel, which forms the bright red complex nickel bis(dimethylglyoximate) (Ni(dmgH)2). The reaction was discovered by L. A. Chugaev in 1905. Cobalt complexes have also received much attention. In chloro(pyridine)cobaloxime the macrocycle [dmgH]22− mimics the macrocyclic ligand found in vitamin B12. ^ Lev Tschugaeff (1905). "Über ein neues, empfindliches Reagens auf Nickel". Berichte der deutschen chemischen Gesellschaft. 38 (3): 2520–2522. doi:10.1002/cber.19050380317. ^ Girolami, G.. S.; Rauchfuss, T.B. ; Angelici, R. J. (1999). Synthesis and Technique in Inorganic Chemistry: A Laboratory Manual (3rd ed.). pp. 213–215. This page was last edited on 13 November 2018, at 00:23 (UTC).